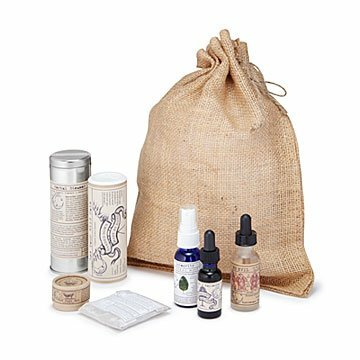 Molly Watman and Emma Graves developed this natural skincare set to work with your skin’s natural cycle. Your skin completely regenerates about every 27 days. It has the whole fresh and new thing covered on its own, but that doesn't mean you can't give it a little help along the way. Revitalize your face and body with this set of nurturing spa products designed to work with your skin's natural cycle. Created by Molly Watman and Emma Graves, each oil, mist, cleanser, and balm is emulsifier and preservative free, and works with all skin types. The makers (Molly's an artist who began studying herbs after her first child was born and Emma is a certified herbalist)source organic, sustainable ingredients, craft skincare collections in small batches, and use their products with their own families. Believing that beautiful skin isn't simply "under control," it's healthy from the inside out, they developed this set as an easy way to meet skin's basic needs and start a skincare ritual that works with your skin instead of just on it. Handmade in Brooklyn, New York. Molly Watman and Emma Graves joined forces to open their Brooklyn's apothecary studio in 2011. They called it, “a place for herbs to live.” Since then, Molly, an artist and graphic designer who started studying herbs after her first child was born, and Emma, a certified herbalist who’s been working in skincare since 1998, have grown their line of all-natural, small-batch products to include a wide assortment of oils, balms, and more for healthy, vibrant skin. As their business and families grew (they now have five children between them), they invited other talented herbal crafters, herbalists, and aestheticians to train with them and expand their community. By sourcing organic herbs and botanicals as close to home as possible, they’re able to get to know their suppliers’ farms and practices. All of their raw materials are prepared in Brooklyn, and they use everything they make on themselves and their own families. As they grow their line, Molly, Emma, and their team keep three words in mind: gratitude, compassion, and generosity. Keep dry and out of sun light.